The semester is over, so let’s get back to work on Dinosaur Island! 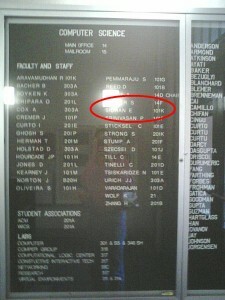 I’ve had a wonderful time teaching computer science at the University of Iowa as a Visiting Assistant Professor but now the semester is over and it’s time to get back to work on Dinosaur Island. Most professors assign reading at the beginning of the semester, but I want to share a number of great academic papers that have been forwarded to me and I am just now getting time to read. First is a fascinating and very important paper by Dr. Nathan P. Myhrvold entitled Revisiting the Estimation of Dinosaur Growth Rates (it can be downloaded here). Myhrvold writes, “The analyses reported here find that only a few dinosaur growth data sets exhibit a marked slowing of growth with age and that most previous qualitative assumptions of asymptotic growth were incorrect.” And, “Mature individuals seem to be missing or underrepresented in the data on a wide range of taxonomic groups, including ornithopods, theropods, ceratopsians, hadrosaurs, sauropods and prosauropods.” In essence, Myhrvold suggests that some dinosaur growth rates are lower than previously thought. Dinosaur Island is – for lack of a better phrase – “An Excel spreadsheet for dinosaurs.” By this I mean that Dinosaur Island was designed to play ‘what if’ with various models of dinosaur behavior, growth, food consumption, etc. Below is a portion of the dialog box in Dinosaur Island where the user can change the rate of growth and food consumption requirements for a T. rex. 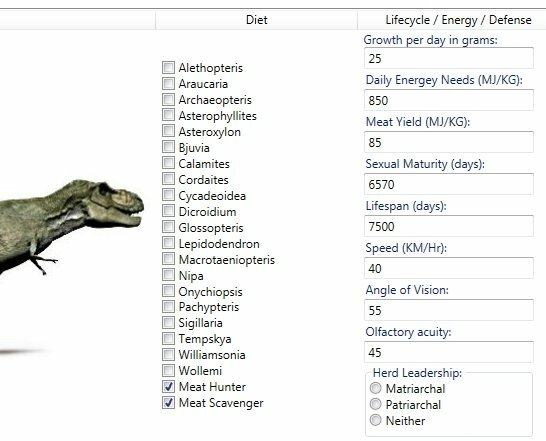 Portion of a dialog box that allows the user to change the rate of growth and food consumption variables for a T. rex (screen shot from Dinosaur Island). My recent work on creating an equation for calculating the probability of a dinosaur detecting another dinosaur by scent (see New scent detection algorithm integrated into Dinosaur Island link here) has brought some welcome feedback. Paleontologist Dr. Jordan Mallon kindly forwarded the Science article Nostril Position in Dinosaurs and Other Vertebrates and its Significance for Nasal Function by Lawrence M. Witmer can be downloaded here (note, subscription needed to download) and Evolution of olfaction in non-avian theropod dinosaurs and birds by Zelenitsky, Therrien, Ridgely, McGee and Witmer) can be downloaded here. 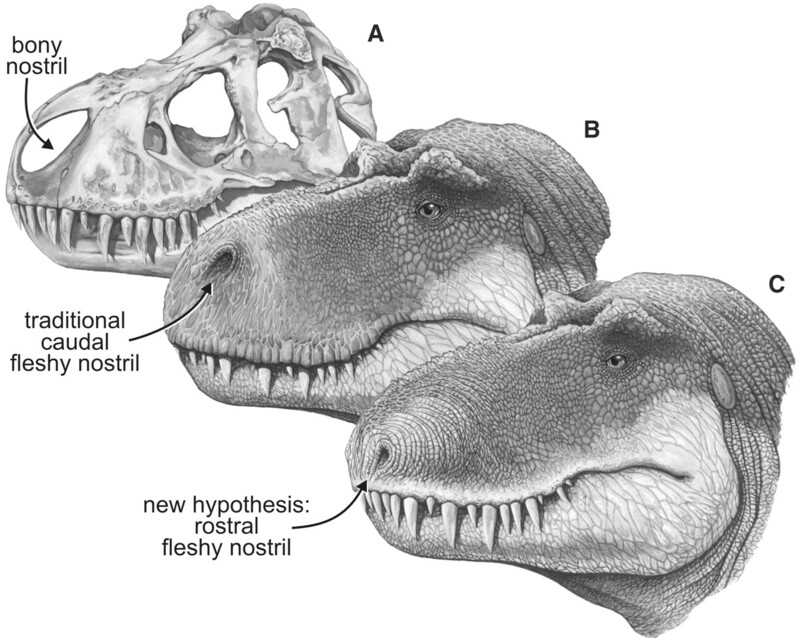 Skull and fleshed-out restorations of the head of the nonavian theropod dinosaur, Tyrannosaurus, rex, in left rostrodorsolate ral view showing the bony nostril and varying views of the position of the fleshy nostril. (A) Skull, showing the bony nostril; note also the narial fossa on the bone’s adjacent to the opening. (B) Head showing the caudal position of the fleshy nostril typically depicted in most scientific and popular restorations. 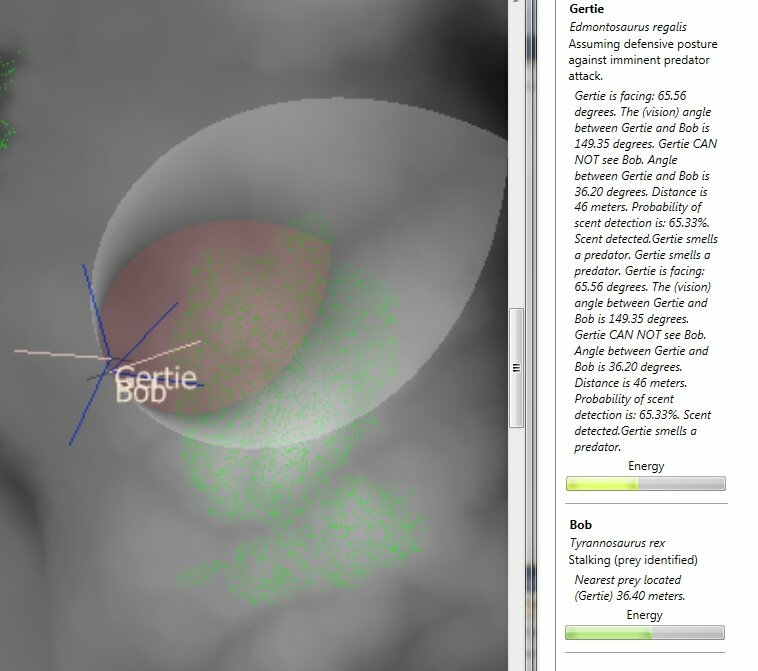 (C) Head showing the nostril position of the fleshy nostril supported by the data presented here. 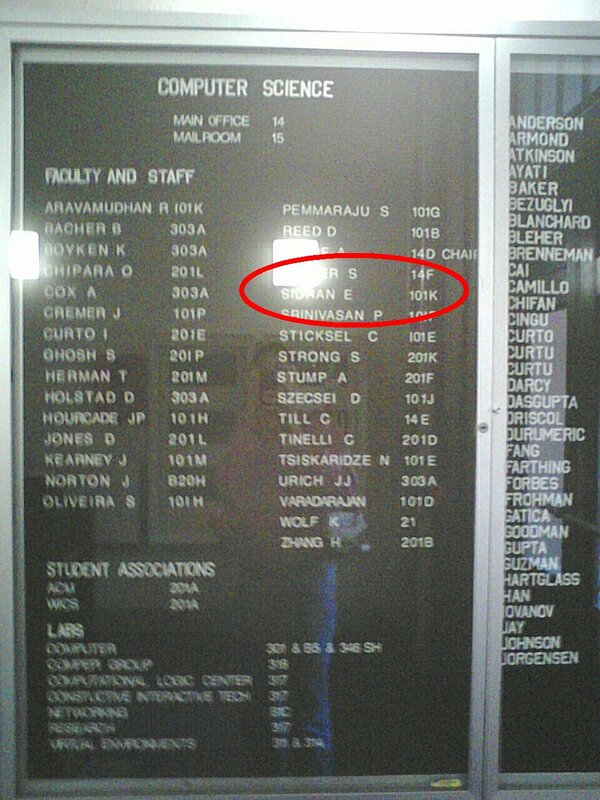 From Science 3 August, 2001 (click to enlarge). I would also like to mention two other articles that have been forwarded to us: Intra-guild competition and its implications for one of the biggest terrestrial predators, Tyrannosaurus rex by Carbone, Turvey and Bielby (download here) and Eulerian-Lagrangian model for predicting odor dispersion using instrumental and human measurements by Schiffman, McLaughlin, Katul and Nagle (download here). The Schiffman, McLaughlin, Katul and Nagle article presents a model for odor dispersal in swine confinement facilities. It did not include an equation, but the results seem similar to my own work here. However, my equation produces a more ‘bulbous’ dispersal pattern (NB: changing the values M and the multiplier (1.5) of WindSpeed (or adding a multiplier to (90 – angle) would create a longer and thinner detection area that is similar to the Eulerian-Lagrangian model). Two other articles that are of special importance to our research are Binocular vision in theropod dinosaurs by Kent A. Stevens (can be downloaded here) and Relative brain size and behavior in archosaurian reptiles by James A. Hopson (can be downloaded here). We are always very happy to receive email; especially when a link to a fascinating article (like those above) is included. Please feel free to forward scholarly articles that are relevant to the development of Dinosaur Island to Ezra [at] Dinosaur-Island.com.